I am so glad I found this video. I have been struggling sooooooooooo bad, I can’t walk and have pain and cramping, dehydrated, adrenal stress, hypothrmia,etc…. It has progressed a lot in the last 2 weeks. I am also a Christian. Thank God we have Him, Bless you. Could you tell me what you did for body work? I saw a pic of you in a hospital bed. Was that a detox hospital or center? Feeling desperate, but I know God is leading me. OH Tiffany I SO apologize that I am just now getting to your comment. Our lives have been upside down this year so PLEASE forgive me. I totally understand your situation. I will be adding an FAQ page to our site next week and I will be doing some live videos to assist and share my detox protocol and the things I have learned. The picture in the hospital bed was the day of my explant. I have doing an all natural detox for the last three years. 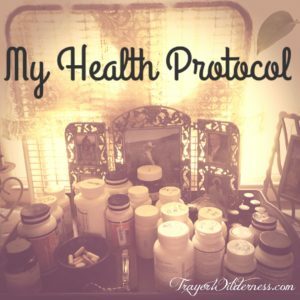 My protocol has changed several times, but there are some specific parts of my detox that I feel have catapulted my healing which I will be sharing. Be sure to sign up for our newsletter http://trayerwilderness.com/newsletter and also join me on Facebook if you can – if not subscribe to our youtube channel because I air my Facebook Live videos there also. http://trayerwilderness.com/youtube. Feel free to reach out to me at survive @ Trayerwilderness . com. I would love to speak with you more and see how you are progressing God is good – I give him all the glory! He has done amazing things in my life and saved me to use me as a vessel to help others! God bless sweet friend and my God continue to heal you! Hi Tammy, I just watched your video on Breast Implant Illness. It almost sounded like you were telling my story. I am almost 3 weeks out of having my implants removed via Enbloc and I was wandering if you could tell me what you used to detox the silicone from your body. I seen you are using a Needle soak, but I’m not sure if i understand what that is. Hi Sandy, I am SO thankful that you messaged me and I am SO thankful to hear that you are on the healing side of this illness. I apologize that it has taken me a while to return your message. Our lives have been quite crazy and overwhelming this year. I would be happy to share more details with you on the soak. The soak I use can be found here http://trayerwilderness.com/gold105. The soak helps pull the silicone from the body. I soak in this as much as I can afford to. It really really helps. I am not aware of anything else that works like it does. You just add 4 oz to a full tub of hot water and just soak your whole body. It does suggest to soak your head as well, but if you have long hair I would recommend having lemon juice and baking soda ready to help get the stickiness out of your hair. Please let me know if I can be of further help to you and reach out anytime. I will be adding an FAQ to our site and I will be doing some live videos to share more on my protocol and the things I have learned through my healing process. Here is a video I just did that will be of great help to you – https://www.youtube.com/watch?v=DlHWXccKhrw. My God continue to heal your body! God bless sweet friend! I will surely be ordering the soak and watching the video. I am now a little over 3 months post surgery and was hoping to be feeling better then I am. Thank you so much for your help and well wishes! God Bless You!! I enjoyed reading this. I am now trying to detox after my explant and feeling pain in my gut, it hurts. I’m going to need to figure something out. Hi Michelle, Thank you and I am glad to hear you are on the other side and detoxing! I just did a very important video that may be of help to you on the most important thing I learned while cleansing and detoxing – https://www.youtube.com/watch?v=DlHWXccKhrw. It is important to really be cautious as to what you are putting into your body. I gained great gut health by doing a 7-day bone broth cleanse – I used this bone broth – http://trayerwilderness.com/bonebroth. Stay tuned because I am going to be adding an FAQ page for the protocol and also doing a more in-depth view of my detox protocol. I have learned SO much through this process and will be sharing more and more. I am gaining better health daily as a result of my research and new knowledge and I desire to help as many people as I can. Please do keep in touch and do not hesitate to reach out at any time! May you continue to heal your body and regain your life! God bless!